I recently was a guest on the Laura Flanders Show to discuss the factors contributing to the mass opt out movement that has developed around the nation, now the largest uprising in U.S. history against high-stakes, standardized testing (see the below video). I have been traveling around the country on my book tour for More Than a Score: The New Uprising Against High-Stakes Testing and meeting with an outpouring of people looking for inspiration and organizational strategies for resisting the testocracy. Last week I spoke to packed audiences in Washington, D.C., Baltimore, and Chicago where parents, students, and teachers turned my book reading event into an organizing session to forge connections and relationships that will undoubtedly lead to new testing boycotts. In my home town of Seattle, we are already seeing the greatest number of opt outs in our city’s history with so many hundreds of opt outs of the new common core tests at my school that the teachers are no longer being asked to administer the test. 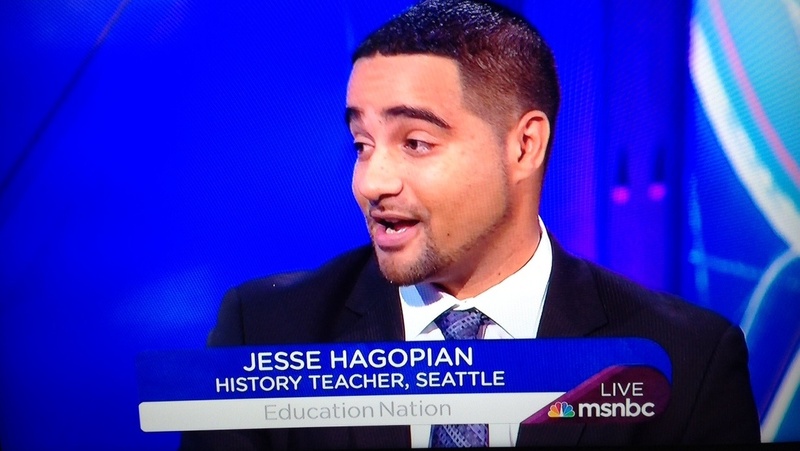 At Seattle’s Nathan Hale High School, 100% of the school’s 11th graders opted out of the 11th grade Common Core test! During the past year students have refused to take high-stakes tests at unprecedented rates. The largest walkout against high-stakes tests in U.S. history happened this school year in Colorado when more than 5,000 students refused the new end-of-course exams and rallied to express their view that standardized testing is eroding the quality of public education. Then in New Mexico in March, over one thousand students walked out out of school against the Common Core PARCC test. But it is in New York State where the revolt has truly reached a mass scale. Preliminary reports show over 180,000 NY families have opted their children out of Common Core testing in an unprecedented act of mass rebellion that is proelling the “Education Spring.” This collective act of struggle to defend students’ civil rights has the power to challenge NY Gov. Como’s test and punish policies—most recently enacting policy that mandates 50 percent of a teacher’s evaluation to the state tests. In the first part of the Laura Flanders Show I explain the dynamics contributing to this uprising, but it is the second half of the show, “Perfect Storm,” that explains what the real high-stakes are if our movement doesn’t win. 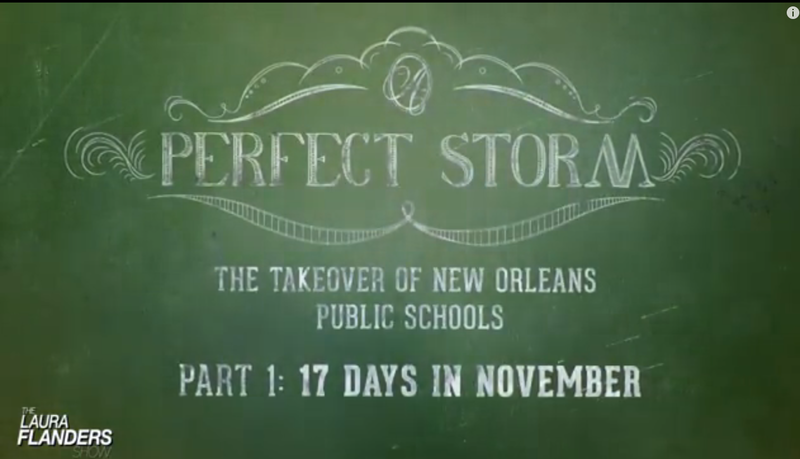 This expose explains how the testocracy moved into New Orleans in the wake of Hurricane Katrina, labeled the schools failing, and converted 100 percent of the public schools into privatized charter schools. This is the vision that the testocracy has for the rest of nation: label our schools, students, and teachers failing so as to erode one of the last free and public institutions left in the U.S. The U.S. Secretary of Education, Arne Duncan, even went so far as to say Hurricane Katrina was “the best thing that happened to the education system in New Orleans.” Thankfully, New Orleans parent advocates such as Karran Harper Royal, who is interviewed in the segment, have exposed that charter schools have not improved education in the city and have organized to defend the public schools. Watch the Laura Flanders Show’s portrayal of two possible futures: the end of public education or the mass rebellion of students, parents, and teachers against the testocracy. Then pick which of these futures awaits our nation.